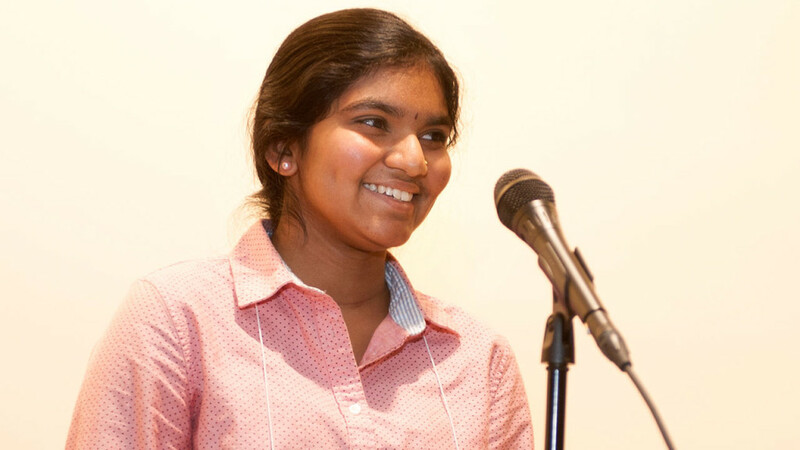 Dwaritha Ramesh, an eighth-grade student at Granby Memorial Middle School, bested 62 other students from around the state Saturday to win the Connecticut Spelling Bee. Dwaritha Ramesh, an eighth-grade student at Granby Memorial Middle School, bested 62 other students from around the state Saturday to win the Connecticut Spelling Bee at Quinnipiac University. Ramesh, 14, will represent Connecticut at the 2016 Scripps National Spelling Bee in National Harbor, Maryland in May. The Quinnipiac University School of Education, which sponsored the spelling bee, will cover the cost of the flight and hotel for Ramesh and one parent or guardian. The Connecticut Spelling Bee, which was open to students in grades four through eight who qualified by winning their local spelling bee, drew students from Andover, Ansonia, Avon, Bloomfield, Bridgeport, Brookfield, Clinton, Danbury, East Haven, Easton, Glastonbury, Greenwich, Guilford, Hartford, Monroe, New Hartford, North Branford, Old Greenwich Pawcatuck, Ridgefield, Riverside, South Glastonbury, Thomaston, Vernon, Waterbury, Watertown, Westbrook, West Hartford, West Haven, Wilton and Winsted.